The nation’s best-documented unraced 3-year-old is getting ready for his debut, complete with a CBS TV crew (which is considerably more coverage than the entire Sunshine Millions event received) – Nicanor, full brother to Barbaro, is likely to race shortly. He’s been training in Florida for the winter and the likely spot is a Gulfstream maiden special, either on dirt this weekend or turf the next. “We have moved on from Barbaro. We don’t dwell on what happened,” Roy Jackson said. “We loved the horse and the interest in him is obviously still there. His legacy lives on in the Barbaro Fund and raising money for continued research of laminitis in horses. Nicanor has been working in company with Rockland, a son of Smarty Jones with a few wins under his belt and he’s obviously grown into a large, well-put-together colt, but only time will tell what sort of talent he really has. 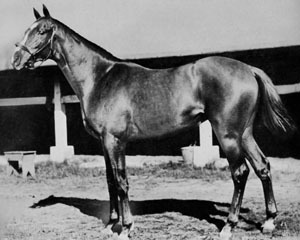 As mentioned before, fine breeding, great training and early promise don’t necessarily make a great (or even terribly good) racehorse (most of Hasili’s offspring excepted, of course), and while there is certainly plenty of symbolic resonance in getting Edgar Prado in to ride, it’s unrealistic to expect too much at this point. Nicanor may well turn into a handy racehorse who will be fun to watch in his own right – let’s sit back and see what happens (and enjoy a brief pre-Triple-Crown spotlight on the sport). (Of course, as an archivist I love the opportunity to see this level of documentation on a single horse’s upbringing, training and schedule – I just hope it’s being retained somewhere. It would certainly be interesting down the line to compare Nicanor’s details to those of the first few Secretariat offspring – or even The Green Monkey). 1 comment to A Long-Expected Party? NICANOR is entered in the 6th at GP on Saturday. What do you make of his chances? Personally, I’d prefer he run on turf as a 3y.o. The poor colt is saddled with the weight of expectation…I hope he’s up to the challenge of being BARBARO’s bro.